Warranty Services - Venture Mfg. 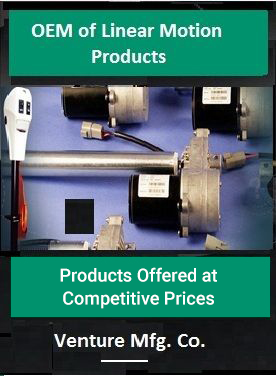 Co.
At Venture, we are dedicated to providing quality products that last for many years. To ensure this, our products are covered with 12 months of warranty, effective from the date of purchase. In case of actuator failure within 12 months from the date of sale due to defects in material or workmanship, we are liable to repair or replace the same. This warranty service guarantees that our products are free from any fault or malfunction when used in the defined applications. Failure is due to improper servicing or lack of maintenance on a timely basis. Defect is due to the clogging of dust, oil, or alcohol based materials and ingestion of foreign materials in the crucial parts of the machine. Product malfunctions due to improper installation and operation without following venture’s recommendations and user manual. The unit is damaged due to improper shipping or handling, alteration/ modification by unauthorized dealer, and careless storage. Product is diagnosed with any misapplication. Using the unit for applications that it is not meant for, results in sudden failures. Serial number or special identification mark of the damaged product is altered or removed. Venture warranty service is offered to original customers, and it is non-transferable. Also, Venture is not responsible for service/repair if you fail to return the product within 90 days from the date of failure. Moreover, the product must be returned in its original packaging to avail the warranty service. Availing our 12 month warranty is a cost-effective way to save the unit from failure and enhance its performance. Once we receive the damaged actuator from the customer, we conduct a comprehensive check by carefully examining each and every part. Repairing/servicing is rendered at the company’s discretion, at no charge, when the root cause of the failure is identified. Also, we take the responsibility to return the repaired/replaced product to the customer’s doorstep free of cost. However, if the product is identified with no defects with the company’s examination, the unit is dispatched to the customer at his expense. Also, in such cases, the customer is liable to pay for additional shipping cost, if any. After the period of 12 months from the date of purchase, we levy a handling charge of $50.00 per unit. This charge is exclusive of any additional repairing/servicing cost. This warranty and the remedies set forth herein are exclusive and in lieu of all other express or implied warranties and no other representations or claims shall be binding on or obligate the Company in any way. Any warranties applicable to our products are limited to the periods described above. In no event will the Company be liable for labor to remove or reinstall the product or any special, incidental, or consequential damages resulting from use or malfunction of this product to the equipment system with which it is applied, loss of revenue, or cost of replacement goods. However, the Company will, at its discretion, work to resolve any issues and share in extra expenses as it may deem fair and reasonable. In regards to all warranty claims, the company’s decision shall be final. To know more and avail Venture warranty services, Call 1-937-233-8792 or email sales@venturemfgco.com between 8 A.M. and 5 P.M. EST.